Okay, so I was watching Giada this morning from her rooftop in Florence, Italy. She proceeded to make cannoli with a renowned pastry chef. It’s not bad enough that she is willowy, well endowed, gorgeous, and the grand daughter of Oscar De Laurentis. She also has a smile that goes on for days, and the ability to eat whatever she wants. I am for lack of a better word, envious. What a life! Needless to say after watching this episode I had the greatest desire for a cannoli. What if I could make the cannoli shells in my air fryer? It would definitely be more waist friendly but it still has to have good texture and flavor. After looking up several recipes on the internet I came up with this version. While it looks like there are a lot of steps they are short and simple. 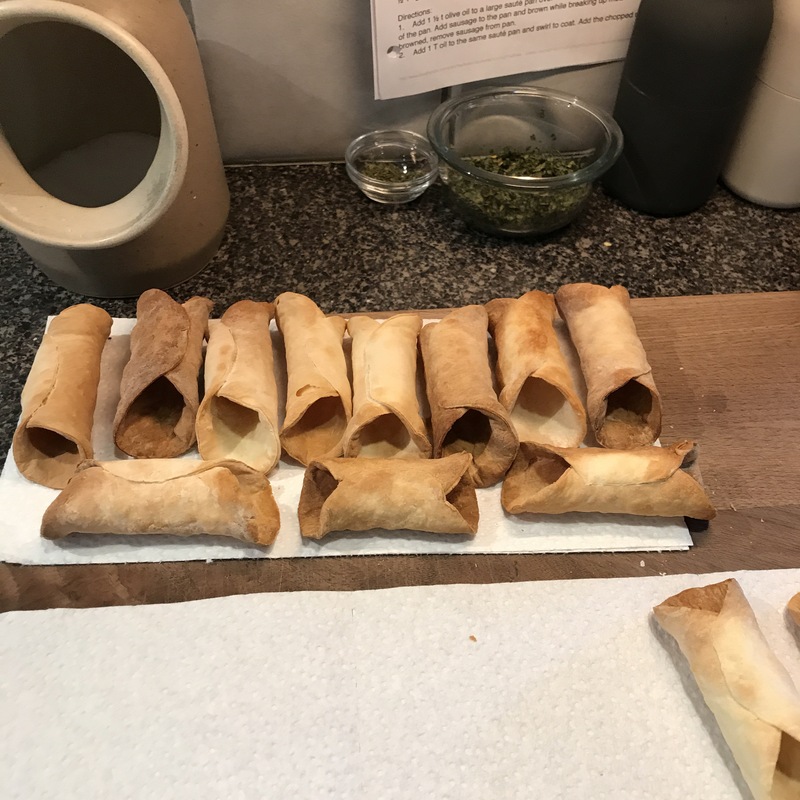 My cannoli tubes came from Amazon.com and were very inexpensive. Just make sure you use caution when removing them from your air fryer, they will be very hot. I used tongs, being careful not to break the shells. By my calculations for 30 servings, my recipe is 5 Smart Points per cannoli. You can add some grated chocolate, chopped nuts, or chopped candied cherries. Any extras will also add additional points. So pick your poison! I liked mine without the fanfare. Drain the ricotta for about 1-2 hours. I use a paper towel lined fine mesh sieve over a bowl. Combine the ricotta, powdered sugar, vanilla, and cinnamon until combined. Use a hand mixer or a hand whip. Put filling into a piping bag, I use baggies, and chill for at least 30 minutes. Mix flour, sugar, and salt in a bowl. Form a ball with the dough and let stand for 30 minutes covered with plastic wrap. Take a small amoutn of dough at a time, keeping the remainder covered. Roll dough almost paper thin, on a well floured surface. Using a 4 inch cookie cutter, or you can use a glass (martini glass works well) and cut into circles. Keep covered until ready to fry. 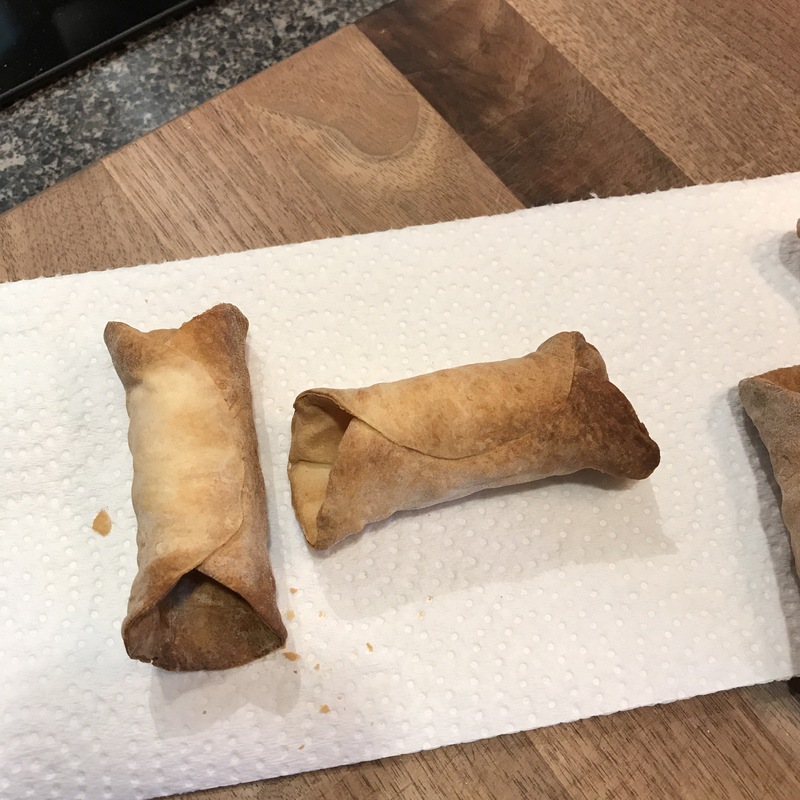 Place 4 of the cannoli in the air fryer at 380 degrees for 5 minutes, open the air fryer and turn them over and fry for an additional 2 minutes. Remove from the fryer and place seam side down on a paper towel. Let cool a minute or two before trying to remove the cannoli form. Hold the cannoli shell down on the paper towel and carefully slide the tube out on one end. Leave them on the paper towel to cool completely. Cut a hole in the piping bag and fill each cannoli at both ends, being carefull not over or under fill them. Sprinkle with powdered sugar, lightly. Note: Unfilled shells can be stored in an airtight container for serveral days prior to filling. Fill as needed and always serve immediately. My dear friends owned a bar fondly known to all of us, as Leaky’s. Some of the best food I have eaten anywhere. All prepared in a kitchen the size of a closet. It was truly my favorite place to eat and play. I will admit to dancing on the bar, but just this one time! As with all good things, they come to an end. 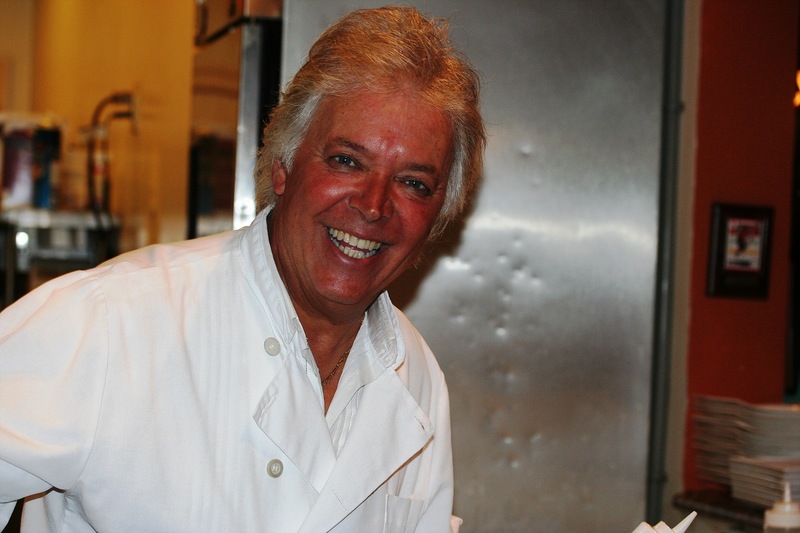 I am fortunate enough to know the chef and actually had the opportunity to work with him for a while. Lucky me!!!! As for the chef, he’s moved on to bigger and better things. Whenever we went to Leaky’s my usual was steamed shrimp and a wedge salad. I don’t know if you know this or not but, all shrimp are not created/cooked equal in the land of food. Leaky’s was and always will be my favorite. Shrimp are also a highly favored food when you are watching your weight. Not only are they said to boost your metabolism but, they are low on the points scale for me. A half pound of shrimp adds up to a total of 4 Smart Points. Throw in a salad and bingo, it’s a great, filling, meal. There really isn’t a recipe for this one. I buy a pound of shrimp, rinse them and throw them in a steamer pot. I add some chopped onion, and lemon wedges and toss all of it in Old Bay seasoning. I use 2 cans of beer in the bottom of the pot to steam them. It takes minutes. When they turn pink and they are no longer translucent, they are done. So don’t walk away, there is nothing worse than over cooked shrimp. I like them with cocktail sauce on the side for dipping. My wedge starts out with half of a romaine heart. Traditionally, it’s a wedge of iceberg lettuce. Then I top it with chopped tomatoes, 2 tablespoons of my favorite bleu cheese dressing, (Lighthouse for me). I add some crumbled center cut bacon and some chopped scallions. Truly a great salad! If you like shrimp and you like quick meals, this is one to remember. Give it a try!